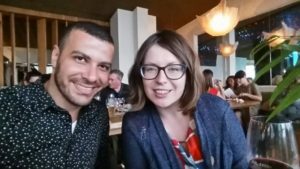 Ola, Shelley and Hadi traveled from Warsaw, Chicago and Beirut and met in the beautiful German town Giessen to present @TaLCGiessen. The center of this vibrant town is the Justus Liebig University, which hosted the conference. We got to explore the many possibilities of corpus research through the pre-conference workshops and a number of interesting presentations. Three presentations in particular related closely to Crow’s work on using the corpus and repository for teaching, or data driven learning (DDL). First, the plenary by Marcus Callies focused on corpus literacy of teachers. He emphasized the need for corpus training in applied linguistics programs and the divide that still exists between novice and experienced teachers in their use of corpora in the classroom. In reflecting on this talk, though, we discussed that a major reason for the divide is that corpus builders can do more to make corpora more teacher friendly, as well as to develop ready-made materials that instructors can take into their classrooms. This is part of what we are trying to do with Crow. Tom Cobb and Alex Boulton presented on a meta-analysis of research on the use of corpus tools for classroom teaching. 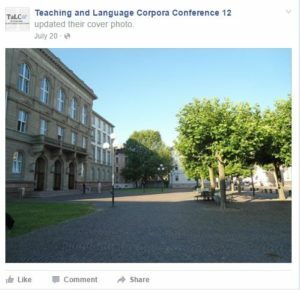 They found that, despite concerns by many teachers and scholars, use of corpora in the classroom was effective even for intermediate language learners. This aligns with the classroom based research project conducted by Crow team. 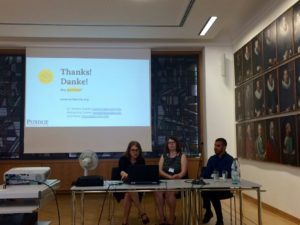 In her presentation “All tooled up: Corpus-assisted editing for academic writers”, Maggie Charles talked about using AntCont – Keyword List, Concordance Plot and N-grams – for the purposes of editing graduate writing (thesis or dissertation). 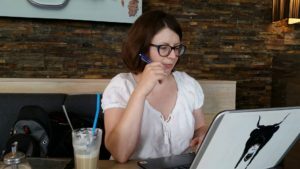 In her work with students at the University of Oxford, she teaches how to use corpus tools to compare the use of terminology used in research articles with the students’ own writing. The students create a keyword list based on research articles and compare it to their own graduate writing keywords. This helps the students to notice differences in the use of terminology and discourse markers to revise their writing. In conversations with Maggie Charles, we were also able to get feedback on our use of the semantic and functional coding schemes we’re employing in our research on reporting verbs. This was especially useful since our study builds off of her 2006 paper on reporting verb use in master’s theses. The conference team made our experience smooth, and after every eventful day at the conference there was either a tour, a dinner, a social or a get-together. 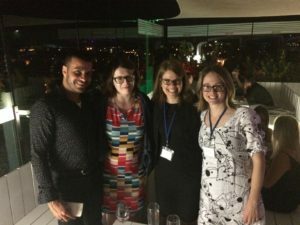 Every new TALC day was another opportunity to meet researchers from Europe and the United States in order to discuss different projects in a multitude of academic contexts. We learned that funding is an important driving force behind the sustainability of big research projects started in Europe. Since funding is competitive in the United States, we started thinking more about bigger grants and possible international collaboration. Our German cultural conference experience was not restricted to academics; we got to experience the fine taste of German beer and the many options we selected from. 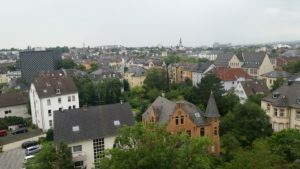 Whether you are a vegan fan, a vegetarian, a pescatarian, or a meat lover, the small town of Giessen can accommodate your diet genres and offer you a range of mouth watering dishes. Being scheduled for the last slot on the last day of the conference did not turn out to be a bad experience after all. Three days of engaging conversations with TALC participants gave us better access to our potential audience. Thus, we decided to tweak our presentation accordingly and implement last minute adjustments that contributed to a successful session. Thinking aloud and rehearsing were things we happily did during coffee and German cake breaks. We were worried about the number of people attending the very last presentation at TALC, but our worries subsided the minute we entered Senatssaal hall. In addition to the decent number in the audience, Ute Romer, MICUSP developer, was listening attentively and taking notes. Our presentation was well received, and the Q and A session exceeded the ten minute threshold. Ute Romer asked about tags accompanying the processed texts and was interested in the broad range of writer characteristics our corpus includes. The concept of first year composition was also compelling to professionals working in Europe because most of the writing they do with their students is in English for Academic Purposes and English for Specific Purposes. Other attendees were keen on asking about the research studies we conducted using data from the corpus. After our session, Shelley and Ola went off to the big city, Frankfurt, where they literally spent twenty minutes climbing the 328 stairs to reach the dome of Cathedral of St. Bartholomew, and there they enjoyed the beauty of German architecture from the high skies. Hadi took a train to Berlin because after a six-week wait to get his visa to Germany, he wanted to make the trip worthwhile. 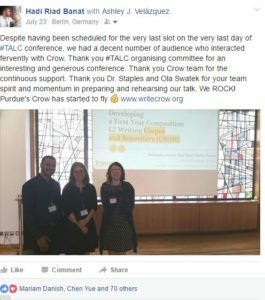 TaLC 2018 will take place in London, and we are hoping by that time Crow will have developed to fly to a new destination in Europe. Until then, Crow team will be busy developing the online interface and conducting research.